Yôko Hikasa, Mariya Ise, Patrick Mölleken et al. Darkness lurks everywhere, in every human heart, and sometimes it takes just a second of weakness for it to take root. For Takao Kasuga, that germination begins when his obsession with his beautiful classmate Nanako meets the opportunity to "borrow" her used gym clothes. Unfortunately, his loathsome act of laundry theft is witnessed by Nakamura, the strange girl who sits behind him in class, and her own dark obsessions soon begin to hook their twisted tendrils into Takao's miserable existence. 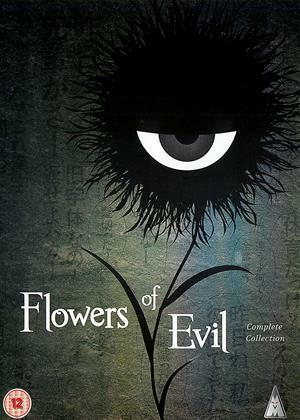 Blackmailed into a "contract" under the threat of having his guilt revealed to his entire class, the former bookworm who could spend hours reading Beaudelaire's The Flowers of Evil now finds himself entwined in Nakamura's own growing fantasies as she leads him down the garden path to damnation. And as their "blossoming" relationship becomes ever darker, even the seemingly innocent Nanako is pulled into the nightmare. Just what are Nakumura's ultimate plans, and will the increasingly trapped Takao really be willing to carry them out? What you sow, you must ultimately reap, and there's certain to be a harrowing harvest ahead in 'Flowers of Evil'!